Streaming on Crunchyroll… in America! Gen Urobuchi wrote some words on a paper and now a bunch of far less talented hacks are trying to make an anime out of it. 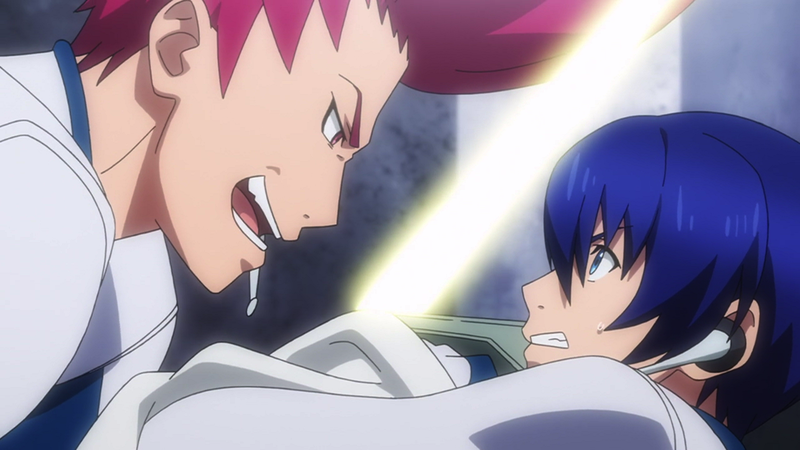 It took me three days to watch Gunslinger Stratos. My Internet has been acting up and whenever it decided to put me out of my misery and abruptly cut off my stream, I couldn’t muster up the courage to continue letting this hapless dross drain my brain cells any further. The sad emoticon displayed on my tablet when the server streaming this debacle to a screen I can comfortably fall asleep in front of dies, displays more genuine emotion than Gunslinger Stratos, a show so brutally dishonest it should be jailed for fraud. For every nuanced, engrossing Gen Urobuchi masterpiece, there’s a disastrous travesty wearing his hollowed out skin as a mask and expecting to get away with it. 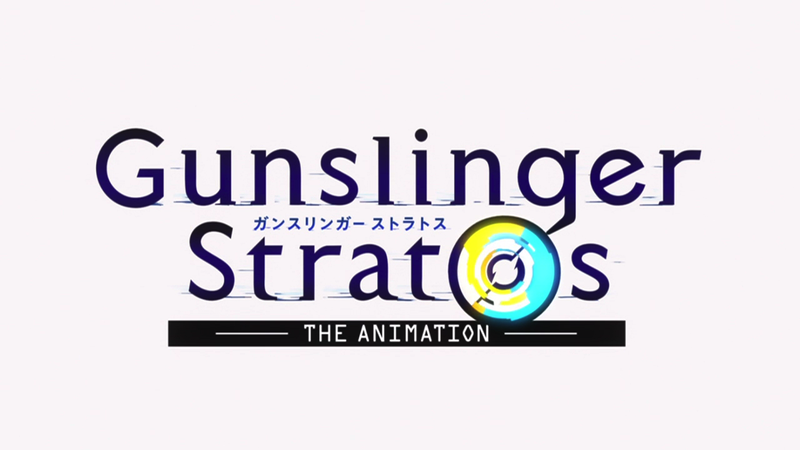 Gunslinger Statos is the latest in the ever-growing pool of lazy cash-ins pulled from a hat with ‘original concepts’ by the Madoka Magica scribe, but a concept does not sell a show. Execution does. There are countless numbers of cinematic abominations with appealing concepts, and probably even more classics with awful ones. A concept is but the first letter on a page. It doesn’t matter if that first letter has been lavishly typeset by a Nobel Literature Prize laureate, if the thousands of words that follow are rubbish, that’s where your book belongs. Gunslinger Stratos is rubbish; both a pathetic attempt at emulating Urobuchi’s pet tropes and a luscious, destructive storm of clichés. It starts off on an esoteric dream sequence and segues into a monologue on human nature with the subtlety you’d expect from an arcade game adaptation named ‘Gunslinger Stratos‘. The difference is that when Urobuchi makes his characters monologue, he does it to contribute to a progressive and profound theme which will likely permeate throughout the entire work. When Gunslinger Stratos does it, it features the line “I hope I am a fluffy sheep”. Tohru is an insufferable main character, stopped only in his — entirely informed, of course — potential to be the best at everything by his incomprehensible desire to be normal. Yup, that’s the two most infuriatingly trite male anime protagonist clichés into one bland snot of a ‘hero’, and it pleases me to inform you that even then, still not a single other character manages to upstage this unbearable pile of sawdust and shredded light novel pages. 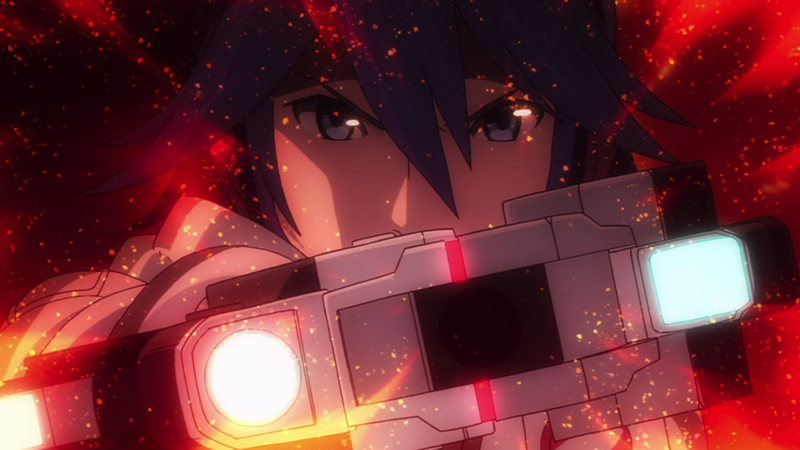 The banal future Gunslinger Stratos calls home isn’t a lot better. There are flying cars, holograms and an oppressive ‘ranking’ system, but it serves seemingly only to assert you that the main character is totally flawed because he is oppressed you guys. Convenient news broadcasts and boring classroom sessions happily explain how the world works and why that is A Bad Thing, because God forbid we’d immerse you in the setting by actually, y’know, showing Tohru getting oppressed, mega-corporations dominating everyday life or people mysteriously vanishing into thin air. In some kind of twisted acknowledgement of the general lack of excitement to be gleaned from its worldbuilding, Gunslinger Stratos sends Tohru and his lady friend Kyouka back to the definitely far more original setting of… present-day Tokyo. A few pretty action cuts manage to provide an easy thrill, but from the get-go, it is painfully obvious that Gunslinger Stratos has no idea how to hide its arcade shooter (!) roots. Its 2015 Tokyo is just as uninspired and populated with over-designed stereotypes fighting for no reason as its 2115 one is. Is it me, or does that sound… kind of awesome? In the right hands, this story could have been one of badass swashbuckling action and nuanced conflicts between order and chaos. This abominable pilot has me convinced, however, that these hands have long since washed themselves of this franchise. It’s almost a pity the people who had to turn Gunslinger Stratos into an actual story couldn’t be bothered to show us the Frontier S. Or to address the totalitarianism of the 17th District. Or to think of an actually interesting protagonist to explore this setting with. Or to learn how to write believable dialogue. Or to think up some likable characters. Or to make us care about why Tohru ended up in 2015 and why people are shooting each other up at all. But, hey, what did I just say about concepts and execution? You can’t polish a turd, but you sure as hell can ruin a diamond. I agree with everything Aqua said, I just wanted to mention I wish we played Paintball & Beam Sabers in gym class when I was in school. Also this is the second ugliest thing A-1 Pictures has ever put its name on, with only this season’s Ultimate Otaku Teacher looking worse. Actually, I’d put Nanoha ViVid, also this season, in third place on that list. Seriously, where did all that Sword Art Online money go?